This is a beautiful card. I love the design. Really Christmassy. Lovely card Sylvie.....like the stamp set. You always come up with something fab Sylvie and this is no exception! Thanks so much, it's super. Wow another beauty from you. Love your work always a pleasure and this is no exception. Brilliant card - I love it Sylvie. What a brillant card, love it. 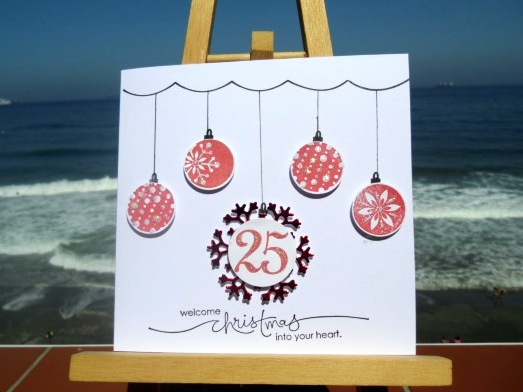 A perfectly SPLENDID idea for a card - looks faberoony! A lovely card for this challenge. Well done. such a beautiful Christmas card! Wow gorgeous card love it! I can't believe either that I beat you too it over at LIM!!! Tilly is well thank you for asking. Lovely card Sylvie and a great take on the challenge. Just lovely Sylvie! fabulous Christmas card. Wonderful little ornaments. This makes a lovely Christmas card. What a pretty Christmas card, Sylvie!! It's so hard to think of Christmas when it's 103 degrees here in Virginia...but I do long for the cool of December:)! !